The BBMP council elected its 50th Mayor and Deputy Mayor amidst high-drama on September 28, 2016. (Wednesday). G Padmavathi (56), Congress corporator from Prakash Nagar ward was elected as the Mayor of Bengaluru and JD(S) corporator M Anand (53) from Radhakrishna Temple ward was unanimously elected as the Deputy Mayor. With it, the Congress and JD(S) coalition continues to rule the BBMP for one more year. In the backdrop of coalition of the two parties that continued in this election, it was quite clear that the BJP had little role to play in the election, yet the Mayoral polls witnessed moments of high-drama. The BJP councillors upset over the Regional Commissioner M V Jayanthi for barring the voting rights of two of its councillors – Independent MP Rajeev Chandrashekhar (who supports BJP) and PC Mohan (MP from Bengaluru Central), boycott the election in mid-way. Election scene was mostly peaceful till the counting of votes for the Mayoral post. There were two candidates contesting for Mayor’s post – G Padmavathi from the Congress and D H Lakshmi from the BJP. While the actual strength of BBMP council this time is 269 (including corporators, MLAs, MLCs and MPs), 262 were present when voting process for Mayor election began. G Padmavathi secured 142 votes, while D H Lakshmi received 120 votes. Meanwhile, MPs Rajeev Chandrashekhar and P C Mohan arrived at the council hall. Regional Commissioner M V Jayanthi who was conducting the election, allowed them to enter the hall, but denied them the rights to vote in the Deputy Mayor’s election. She cited Section 72 and Section 73 of the Karnataka Municipal Corporation (KMC) Rules and said it does not give the right to vote for those who enter the scene when the election process is under progress. Votes of these two members wouldn’t have made any difference to the BJP which anyway had no majority in the council. Yet, upset over Jayanthi’s decision, BJP councillors including MLAs Aravind Limbavali, Suresh Kumar, corporators Padmanabha Reddy and Katte Satyanarayana questioned her and even accused her of being partisan. Rajeev Chandrashekhar and P C Mohan said they arrived late to the election due to the all party meeting called by Chief Minister to discuss Cauvery issue. 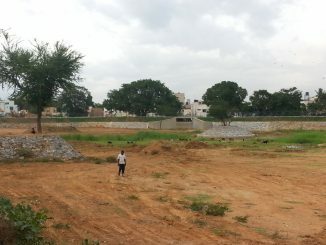 This was enough to spark Cauvery debate in the BBMP council even as the election was underway. Both the Congress and BJP leaders entered into loggerheads to gain political score over each other. While the Congress blamed BJP for not supporting the State in its fight for water, the BJP criticised the Congress for not giving enough importance to the issue, which they said was reflected in the way the voting rights are denied. Within no time, the election hall turned out to be a den of chaos. The BJP, despite having nominated a candidate (Gurumurthy Reddy) for Deputy Mayor’s election, boycotted the polls and walked out. In the absence of BJP councillors, M Anand was unanimously elected as the Deputy Mayor. MPs Oscar Fernandes, B K Hairprasad, Jairam Ramesh, M Veerappa Moily and most of the Congress MLAs were present. Later in the day, MP Rajeev Chandrashekahar, in a press release has directly blamed the Congress party for preventing him from voting and has said that he would approach the High Court. “According to me the Cauvery water issue takes precedence over Mayoral elections. Along with other MPs and MLAs, MP PC Mohan and I were at the all party meeting till 12 noon and rushed to the BBMP Council meeting immediately thereafter. By the time we reached we were told we arrived late and hence stand disqualified to vote for Deputy Mayor – for which the voting process was yet to begin,” he has said. The newly elected Mayor, addressing the media said that her top priorities are road repair, waste segregation and garbage disposal. “My predecessor has done a good job during his tenure including good property tax collection. Waste segregation has been introduced, garbage handling too has been streamlined. I will continue to work on those lines,” she said. While there is usually much anticipation and buzz created around the election of the mayor — and the mayor does enjoy significant functional power on paper as the chief of the local city government, the lack of real executive and financial powers of the Mayor has been brought to the fore many a time by civic analysts and experts. mandatory time-bound constitution of a Metropolitan Planning Committee to be headed by the Mayor. Not surprisingly, mayoral elections hit the headlines every year due to the voting associated with it, especially when the parties that have no clear majority have to indulge in trade offs to retain the seat of power. As Bengaluru gets yet another mayor who will stay only for an year, it would perhaps be a good time to look at these issues more than the politics involved in the procedure.